Now that the air has turned chilly I hope those of you who have a custom, handmade Memory Quilt are curling up into the quilt with not one, but many, memories that you hold dear. This past month has been incredibly busy for me. I am working on over 20 holiday quilts for some very lucky people! I can imagine their surprise and wonderment as they open their quilt filled with special memories on Christmas morning! If you are interested in a Memory Quilt for you or a loved one please contact me ASAP so that I can add you to the list! My holiday schedule is almost completely booked. But please remember that there are many holidays through out the year for gift giving. Below is my Quilt of the Month and some other great quilts that I have made this past month. Each quilt was designed and made with input from me, the client, and sometimes the recipient-a true team approach! That's right, this 87" by 87" custom, specialty quilt contains 75 ties that were creatively designed into the popular Dresden plate quilting pattern. There are 25 Dresden plates and each contains 6 ties and the center is made from a very special silk "smoking jacket." My client sent the picture, shown to the right, of the finished quilt hanging in her beautiful home! The quilt contains 2 borders. The first border was made from the leftover pieces of ties. Every piece of tie was used by the end of this project! The quilt was then "framed" with a gorgeous black fabric. The Baptist fan quilting pattern was long arm quilted into this 7" border. It frames the quilt beautifully. A white tone on tone paisley fabric was used for the body of the quilt. A beautiful meander stitch was long armed onto this portion of the quilt. When I first was given the box of 75 ties, I didn't know what I was going to do with all of them. A year later, this work of art is complete! Anyone interested in a tie quilt should contact me for a quote. 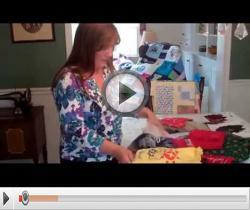 They are a custom specialty quilt that take an enormous amount of time. My client contacted me to help her finish this quilt. She had printed out over 15 pictures of her dad onto fabric but she didn't know what to do next. Between the two of us we came up with this design that honors her dad and the service he provided to our country. 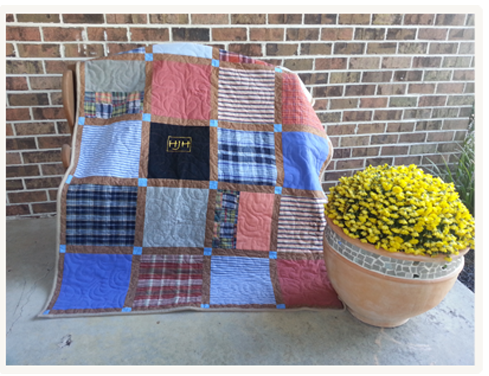 This traditional style, large lap quilt was made in honor of Lt. Colonel James A. Green. On it are pictures from his Air Force days, of him later in life, a caricature of him, a picture of the plane he flew and his wings-all surrounded by his shirts, fatigues and uniforms. I feel like I know Lt. Colonel James A. Green just a little bit now. That is the joy of these quilts. They really do tell a story, and this story is beautiful! If you have begun a Memory Quilt and can't seem to finish it, call me and together we can make your quilt become a reality! Currently my Memory Quilts by Molly page has 29o fans, and for this I am very grateful. But, it sure would be nice to break 300! I only need 10 more fans to do this. If you haven't been to my Facebook page I encourage you to do so! You won't learn about anything too deep like the origins of the universe, but you will be entertained by the many wonderful stories of memories made into cherished quilts and the creative pictures that I post like quilts hanging in trees, and even quilts with witches and Frankenstein! You never know when your quilt will be showcased or become the witch's cape! Like It If You Do! How Do I Make My Quilts? Watch my 2 minute video! I love making sorority quilts! This is the fourth one that I have made. It was made for a Rochester Institute of Technology graduate who is an Alpha Xi Delta sister with tons of sorority shirts! 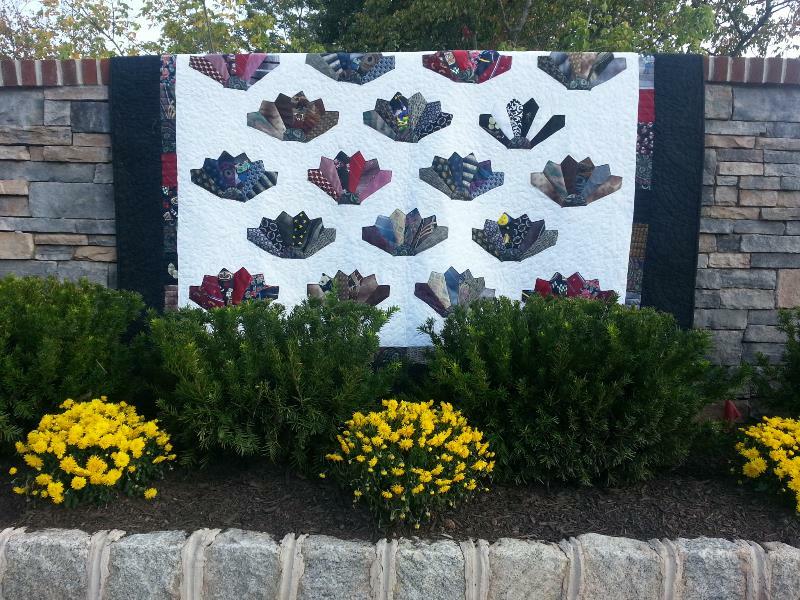 She is a Graphics Designer by trade and she created a digital picture of her quilt exactly how she had envisioned it! One problem though: she didn't know how to make the actual quilt! Her Memory Quilt was just a picture on her computer. Enter Memory Quilts by Molly! I took her exact design and made her traditional style, twin size quilt with block sashing a reality! I just love the glow in the dark jack-o-lantern face t-shirt! Her design was perfect. I didn't change a thing. Together we created a Memory Quilt that she now has on her bed which she can wrap herself in instead of just looking at it on her computer screen! 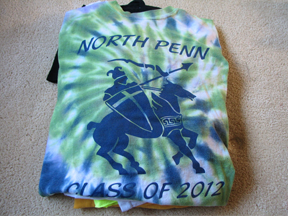 Only one t-shirt was used to make this quilt. It is the black one in the middle with the initials.The other blocks consist of flannel pants, cotton shirts, and even a bathing suit! Beautiful chocolate brown and bright blue sashing was selected. Topped off with a super soft camel colored backing. This pillow was made in honor of Christian Chatman, a man who left us far too soon. 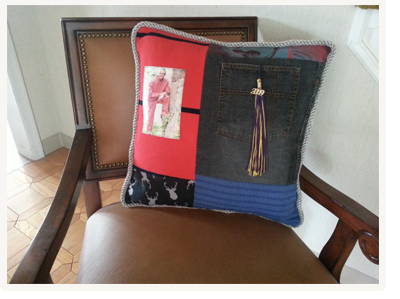 Included in this pillow are his jeans, and in the pocket is his high school graduation tassel. Also included is a beautiful photo of him. May this pillow and the quilt that I made for his mother bring both comfort and sweet memories of Christian.